Phineas and Ferb series finale: Saying goodbye to the Disney Channel show. Saying farewell to Phineas, Ferb, and the evil genius I love the most. The alien would then say—or maybe just think to himself, depending on the role of politeness in his planet’s culture—“That sounds terrible. A show whose plot never changes, about two nicey-nice kids, their goody-two-shoes sister and some harmless villain they never even meet. Plus for some reason a platypus spy? I’m heading back to Quozzrax, warp-speed.” But that alien would be making a huge mistake. Phineas and Ferb, created by Dan Povenmire and Jeff “Swampy” Marsh, has been my favorite cultural discovery of the past year, thanks to my 9-year-old daughter—who, along with the show’s inventive visual gags and earworm-in-the-best-way songs, gradually convinced me to stop wandering in and out of the room pretending to be tidying and sit down and watch with her already. We’re both sad that the series finale will be airing Friday, after a three-day Disney XD marathon (now underway) in which all four seasons of the show are being run in order. But we’ll always have syndication—and given that my viewing of this show tends to be filtered through the formidable scrim of a 9-year-old’s whims, there are a dozen episodes I’ve never seen for every one I’ve seen a dozen times. I’m not a Phineas and Ferb­head, one of those people logging on to the wiki page to correct a fact about how many times and in which episodes the floating baby head or the “My watermelon!” line have appeared (although God bless those folks, because that is one tightly run wiki). I’m just a casual yet passionate parent-fan, someone who, every time I stop doing boring grown-up stuff long enough to catch an episode, grows more impressed with this show’s defiantly strange sensibility, its high estimation of the intelligence of both kid and adult viewers, and its generosity of spirit. Over the past year, I’ve grown to realize that generosity is best observed not in the show’s treatment of its title characters—whose plucky adorability makes them easy to love—but in its treatment of its hapless villain, Doofenshmirtz, of whom I’ve grown inordinately fond. 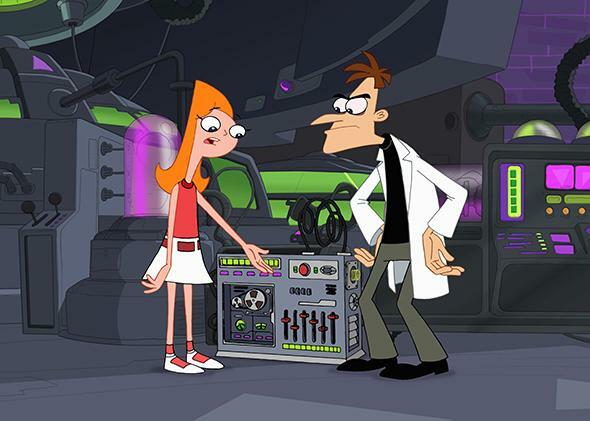 As the hatch of the alien’s ship whooshed shut, I’d protest that the strict adherence to formal structure I described above (which includes several lines of dialogue that recur in near-identical form in almost every episode) is in fact one of the great pleasures of watching Phineas and Ferb over time. Though the show doesn’t, for the most part, build on the storylines of previous episodes—the boys’ empty summer day is invented anew each time, a blank slate for whatever wild invention or adventure they choose to pursue—many of the best jokes spring from the viewers’ (and, at times, the characters’) familiarity with the show’s unchanging format. The episodes I’ve liked best so far are the experimental ones that strip that formula down to its bones, making the audience laugh at both how well we’ve gotten to know the show and how well it seems to know itself. In “Blackout,” the fictional town of Danville’s power grid goes out after Doofenshmirtz’s latest invention, the Big Sad Eye-inator, hogs too much of the town’s electricity supply. Thanks to the longstanding cartoon tradition by which googly eyes can be seen even in the dark (a joke familiar from The Simpsons, but traceable to earlier pop-culture ancestors), much of this episode unfolds in total blackness, with the characters identifiable by their eye shapes alone. There’s no mistaking Phineas’ wide, curious bubbles; Ferb’s odd asymmetrically sized eyes; Candace’s narrowed, distrustful glare; or Doof’s temporarily cuteness-enhanced eyeballs, now so outsized and sparkling he’s sure he can win the world to his side. The average Phineas and Ferb episode (hand-drawn in traditional 2-D style, using the Cintiq graphics tablet) is extravagantly colorful and kinetic. * But even with a visual field reduced to nothing but black-and-white eyes against a black background, anyone with a working knowledge of the show can follow what’s happening in “Blackout”—and there’s nary a googly-eyeballs-in-the-dark gag whose possibilities aren’t thoroughly explored. Similarly, in “Tri-Stone Area”—perhaps my favorite freestanding 11-minute episode and one that gets quoted and re-enacted in my household more than any other—the entire Phineas and Ferb universe is inexplicably transplanted to the Stone Age, where all the characters speak in a primal caveman patois made up of nonsense syllables and grunts. Even without a line of recognizable English dialogue, every story beat is legible. The viewer even starts to learn, by the story’s final twist, some words in the proto-language that at first sounded like gibberish. In this scene, the caveman version of Dr. Doofenshmirtz—who’s voiced, brilliantly as always, by the show’s co-creator Povenmire and who seems to have remained an evolutionary rung or two behind the rest of the cave-cast—watches drops of water slowly form on a stalactite with the delight of someone watching a thrillingly suspenseful TV show. Upon the inevitable arrival of his nemesis Perry the Platypus (or in cave-speak, “Bunka da Bunkaquan”), Caveman Doof expresses his dissatisfaction with the squalid conditions of his cave, comparing it with the prehistoric high life enjoyed by his smug brother Roger. (Their sibling rivalry is an ongoing motif on the show.) The simplicity of this scene gets me every time: With nothing but a few well-placed squeals and grunts, Povenmire somehow communicates the needy yet endearing essence of this complex and bizarre villain. Doofenshmirtz is far from the first cartoon villain to be smacked down by fate at the end of each episode. There’s a touch of Wile E. Coyote in Doof’s endless -inators and more than a little Road Runner in his silent, uncapturable platypus foil. What sets Doof apart is his wishful relationship with his own imagined evil self. His pathetic dream of Tri-State dominion is really just a thinly disguised—and by that I mean completely undisguised—longing for universal adoration and acceptance. He wants to be loved, not feared. The few times he gets a glimpse of success, Doof soon realizes that if were to attain his longed-for goal, he would be the lonely ruler of a fascistic dystopia. Better to stick with his Sisyphean everyday reality of politely greeting his platypus nemesis, capturing him in an elaborate (but fairly escapable) trap, and, with ever-renewed hope, proudly unveiling that day’s doomed -inator.